Yes. It’s that time of the year, again. In a couple of days the Usersnap team is flying over to Helsinki, Finland. Besides us, 15.000 tech companies, startups, and investors are flying over as well. As we’re getting ready for the Slush and packing our bags, we prepared this personal guide for the Slush 16. So, here’s everything you need to know to get the most out of your Slush experience. Slush is more than just the Slush. The Slush officially takes place from 30th November to 1st December. Besides the main event itself, there are a lot side events (a lot! ), and other happenings taking place in and around the Slush. And since I do not want to miss out on the most important things happening at #Slush16, I recommend to have a conference checklist ready. Do I have my flight booked to Helsinki? Do I have my accommodation details ready? Have I secured my Slush ticket? Those are probably the most important things in order to get you started in Helsinki. Great. You secured your Slush ticket and you’re ready to head to Helsinki? One of the first things I recommend doing is claiming your badge. As the opening party and other side events are already happening before the official Slush event itself, you need to get your badge at one of the following badge claim locations. Of course you can claim your badge on Day 1 (Nov. 30th), however, I do recommend you claim your badge in advance. If you have bought your Slush ticket, you’ll get access to the matchmaking tool. 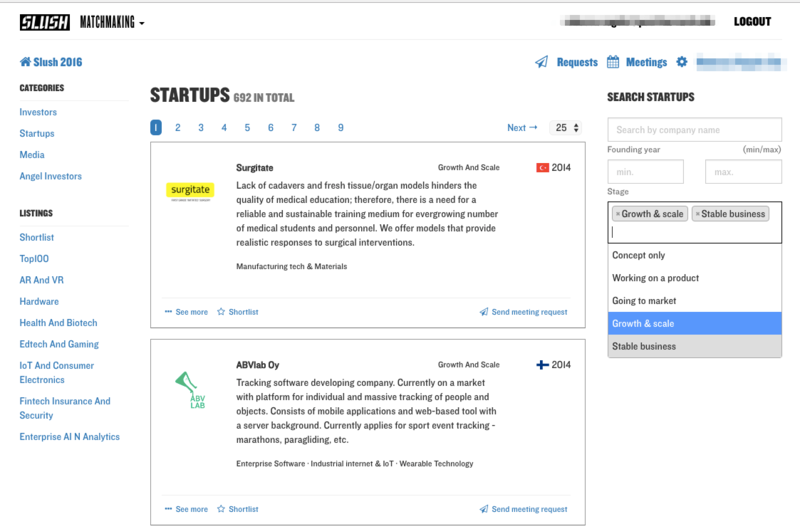 It allows you to browse through startups, investors or media companies. No matter if you’d like to meet fellow startup founders or pitch your company to a certain media outlet. The matchmaking tool is your choice. As I do not want myself be glued to my laptop during the Slush event itself, I recommend to prepare yourself (and your mobile phone) to a better Slush experience. I recommend putting the following apps on your home screen. I absolutely recommend to research and download the official Slush app before traveling to the conference (gosh, public WiFi can sometimes be really bad). Download Slush App for iOS. Download Slush App for Android. I guess at most tech conferences a lot of people hang out on Twitter. So do people at the Slush. Therefore Twitter is a great place to connect with people while attending a conference. I also recommend searching for official hashtags BEFORE the event takes place. In most cases, the Twitter stream isn’t that noisy before the event which enables you to connect with like-minded people and arrange meetings for the conference. If you’re a Twitter boy or girl like me, you might also set up your own Twitter list with interesting people. For example, I created this Twitter list of #Slush16 a week before the event. Ok. This one is important as well. If you’re organized and prepared for the event you probably arranged a couple of meetings with people at the event. So, your calendar app is one of the most important apps during the event. I definitely recommend keeping every (little) meeting you’ve arranged in your calendar. Another networking app is Grip. Grip allows you to engage with other like-minded people and lets you connect with them. 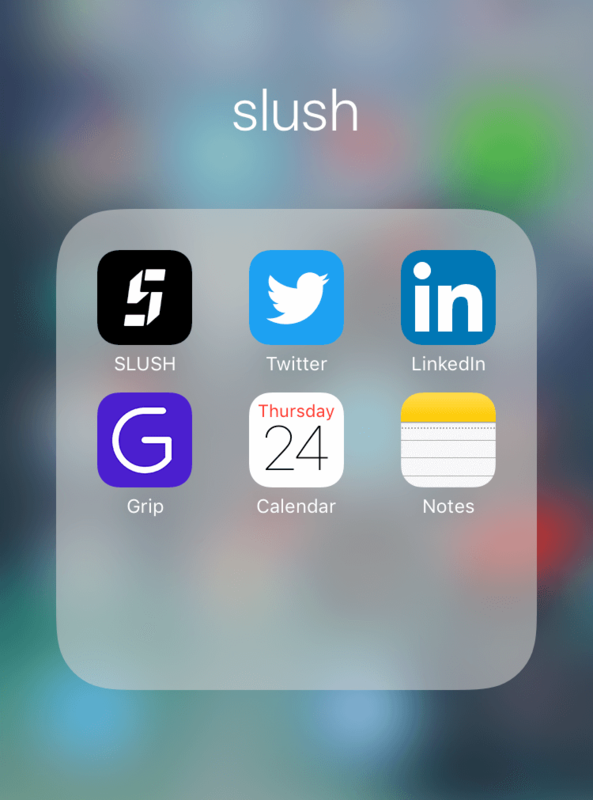 Simply search for the community “Slush 2016” inside the app and start swiping. It works like Tinder. For business. You swipe right if you want to connect & meet with someone. You swipe left if you don’t want to meet that person. A note-taking app is a no-brainer for me. Storing notes, meeting notes or any other tiny detail, helps me to not forget about something when coming home after some exhausting conference days. As mentioned in the introduction, the Slush offers a whole bunch of side events, parties, and other meetups. Getting yourself prepared for the most interesting ones is important. With 15.000 attendees the Slush itself is already a huge event which might make it hard to get in touch with new people. Side events, such as the Slush opening party or the founders day, are a great way to connect with new people on a more relaxed level. As personal interests vary, I really recommend to check out the arctic startup collection beforehand. You can find us at the Founders Day (Tue, 29th Nov.), at the official opening party (Tue, 29th Nov), and definitely at the Slush after-party. The Slush is located a bit outside of city center. You can arrive at the venue by bus, tram, train, car or taxi. However, I do recommend using the public transportation! And the great people of the Slush are giving away free travel cards (at the badge claim locations). The address is Messuaukio 1, 00520 Helsinki. As conference days can be pretty exhausting do not forget to get some nutrition. There are several food trucks and food corners at the Slush venue serving food and drinks from all over the world. Prices for lunch vary from 10 to 15 euros. The Slush is packed with an awesome agenda. Five stages, hundreds of speakers, thousands of startups, and a great exhibition area allows you to explore and be inspired. I particularly recommend taking some time off for strolling through the exhibition and booth area (meet us there!) or simply hang out in one of their lounges. The Slush 100 pitching competition gives startups the opportunity to showcase their products and services. And of course, win some awesome prize. There are three different rounds and I definitely recommend to check those pitches out too (we’ll be pitching Usersnap on Wed, 30th, between 2:45-4pm). And last, but not least. There’s free WiFi available (of course). Simply connect your devices to “SLUSHxELISA” and have a good time. PS: Meet us at the Slush!